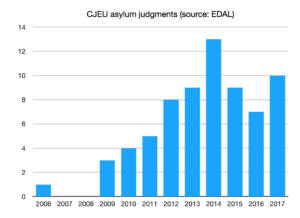 Since the jurisdiction of the Court of Justice of the European Union was expanded to include asylum matters, we have a fairly steady rise in the number of judgments on these issues. Most concern procedural measures which are specific to the EU rather than substantive judgments on wider concepts of international refugee law, such as interpretation of “being persecuted” or the interpretation of the Convention reasons. That said, there are several cases now addressing substantive issues of refugee law. Technically these judgments address EU law. As discussed below, where EU law and international refugee law run in parallel, such CJEU judgments may be of interest elsewhere. The judgment concerns the status of military deserters under the Qualification Directive (2004/83/EC) and the definition to be accorded to persecutory acts following on from a refusal to perform military service. Whilst the definition of military service is to include support staff the CJEU has held that there must be a sufficient link between the asylum seeker’s actions and the preparation or eventual commission of war crimes. The individual must establish with sufficient plausibility that his unit is highly likely to commit war crimes and that there exists a body of evidence capable of credibly establishing that the specific military service will commit war crimes. Moreover, desertion is the only way to avoid participation in war crimes and disproportionate and discriminatory acts should be assessed in light of a State’s domestic prerogatives. When verifying an asylum seeker’s claimed sexual orientation, Member States’ freedom of action is constrained by the Charter of Fundamental Rights. The evaluation of an asylum application should not be based on stereotyped notions and should include an individualised assessment taking into account the applicant’s personal circumstances, vulnerability in particular. Not declaring homosexuality at the outset to the relevant authorities can not result in a conclusion that the individual’s declaration lacks credibility. LGBTI asylum seekers (1) may be members of particular social group, (2) cannot be expected to conceal or restrain their expression of sexual orientation to reduce risk of persecution. (3) All criminalisation does not per se amount to persecution, but imprisonment actually applied does. Stateless persons of Palestinian origin who have in fact availed themselves of assistance from the UNRWA and their right to recognition as refugees on the basis of Art. 12(1)(a) of Directive 2004/83. These cases concerned the interpretation of Article 2(c) and Article 9(1)(a) of the Qualification Directive in a case where the two Applicants are Pakistani nationals who are members of the Ahmadi religious community and fear persecution there on the basis of religion. These joined cases concerned two Applicants who were denied protection in Germany on the basis of the exclusion provisions in the Qualification Directive. Upon appeal the German Courts found that even if they were excluded under the Qualification Directive they may still entitled to the right of asylum recognised under Article 16A of the Grundgesetz. The CJEU, in examining Article 12, the exclusion provision in the Qualification Directive, found that the fact a person was a member of an organisation which is on the EU Common Position List 2001/931/CFSP due to its involvement in terrorist acts, does not automatically constitute a serious reason to exclude that person. Exclusion is not conditional on the person concerned representing a present danger to the host Member State or on an assessment of proportionality. For the purposes of the first sentence of Article 12(1)(a) of Directive 2004/83, a person receives protection or assistance from an agency of the United Nations other than UNHCR when that person has actually availed himself of that protection or assistance. Article 1D of the Geneva Convention relating to the Status of Refugees, to which Article 12(1)(a) of the Directive refers, merely excludes from the scope of that Convention those persons who are at present receiving protection or assistance from an organ or agency of the United Nations other than UNHCR. It follows from the clear wording of Article 1D of the Geneva Convention that only those persons who have actually availed themselves of the assistance provided by UNRWA come within the clause excluding refugee status set out therein, which must, as such, be construed narrowly and cannot therefore also cover persons who are or have been eligible to receive protection or assistance from that agency. This case concerns the interpretation of Article 11 of the Qualification Directive when refugee status is deemed to have ceased to exist. The Court found this is when there has been change of circumstances which is significant and non-temporary and when there is no well-founded fear or other reason to risk being persecuted. States in assessing changes in circumstances must verify that the actors of protection have taken reasonable steps to prevent the persecution and that the person concerned has access to that protection. In making the assessment that there is no further risk the standard of probability used is the same that applied when refugee status was granted. The Qualification Directive obviously addresses the question of who qualifies for refugee status. There are certainly very positive elements of the Qualification Directive which are, helpfully, spelled out in some detail. Article 9 on acts of persecution arguably did not expand UK understanding of “being persecuted” but it did elucidate the concept in a clear way. It certainly makes it easier to train lawyers and students. The expansive definitions of the Convention reasons are helpful and have arguably had an impact on UK case law. To qualify as political the opinion in question must relate to the major power transactions taking place in that particular society. It is difficult to see how a political opinion can be imputed by a non state actor who (or which) is not itself a political entity. the concept of political opinion shall include the holding of an opinion, thought or belief on a matter related to the potential actors of persecution mentioned in regulation 3 and to their policies or methods, whether or not that opinion, thought or belief has been acted upon by the person. The CJEU Lounani judgment on the exclusion clauses follows a similar but not identical approach to that of the Supreme Court in R (on the application of JS (Sri Lanka)) v Secretary of State for the Home Department  UKSC 15. The CJEU requires individual assessment but applies objective criteria. In contrast the Supreme Court applies a more subjective approach and for the exclusion clauses to apply requires a person “voluntarily to have contributed in a significant way to the organisation’s ability to pursue its purpose of committing war crimes, aware that his assistance will in fact further that purpose”. For further analysis see Thomas Beamont’s post. If anything, UK standards of protection for a refugee are higher than EU standards in this instance. The case of C-71/11 and C-99/11 Germany v Y and Z on freedom of religion, persecution and behaviour on return follows broadly the same approach as the Upper Tribunal did in the case of MN and others (Ahmadis – country conditions – risk) Pakistan CG  UKUT 00389 (IAC). The only example of which the author is aware where it has been argued there is an inconsistency between UK and EU law on refugee status is over the question of how far, if at all, a person can be expected to modify his or her behaviour on return to a country of origin in order to remain safe. This issue can arise in cases based on political opinion, religion or membership of a social group, such as groups based on profession or sexuality. In the Court of Appeal case of LC (Albania) v The Secretary of State for the Home Department  EWCA Civ 351 it was argued that there was an inconsistency of approach between UK law in the form of HJ (Iran)  UKSC 31 and EU law in the form of Germany v Y and Z and Minister voor Immigratie en Asiel v X, Y and Z. UK law, it was argued, still included a “voluntary discretion” test which was not consistent with EU law. The Court of Appeal disagreed, although the Upper Tribunal had found some force in this argument in the earlier case of MSM (journalists; political opinion; risk) Somalia  UKUT 00413 (IAC). Even where the CJEU does pronounce on questions of the interpretation of the definition of a refugee, it is pronouncing on EU law not interpreting the 1951 UN Convention Relating to the Status of Refugees. Where the provisions run in direct parallel or the gloss of EU law is a light one, no doubt other courts, such as the UK courts, will be interested to see how the CJEU has interpreted different concepts. From an advocates point of view, using a CJEU judgment as a tool of persuasion is a very different exercise to telling a court that the CJEU has held X and that this must therefore be applied. While the outcome and conclusion of a CJEU judgment is usually clear, the reasoning and logic of these multi-judged decisions is sometimes elusive. On the whole, the advent of the Qualification Directive probably meant a “levelling up” of standards to those already applied in the UK. For example, several EU countries including France and Germany, had to begin recognising that non-state actors could be actors of persecution. On their previous approach, no Somali would ever be recognised as a refugee as there was no state in Somalia. There may also have seen some “levelling down” as the UK was very successful in ensuring that the UK concept of “sufficiency of protection” was incorporated into the Directive. While it seems unlikely that the UK would simply revert to, for example, the narrower definition of political opinion after Brexit, it is surely inevitable that there will be a drift away from the approach followed by the CJEU over time. The concept of “subsidiary protection” is a creation of EU law. 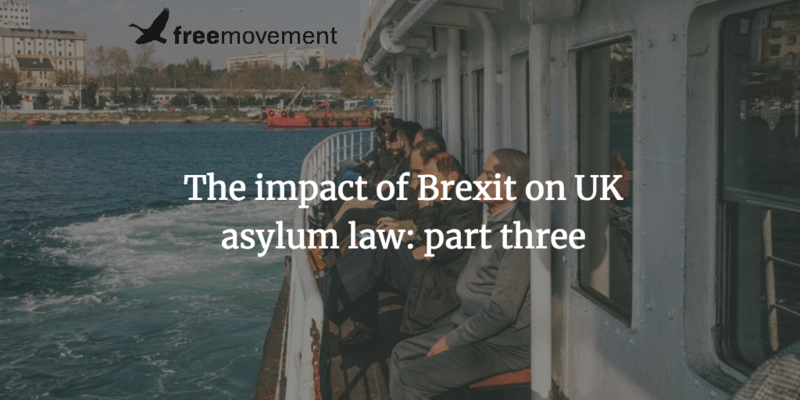 Unlike refugee status, which will remain protected by the 1951 UN Convention Relating to the Status of Refugees after Brexit, the legal underpinning for subsidiary protection will be lost. 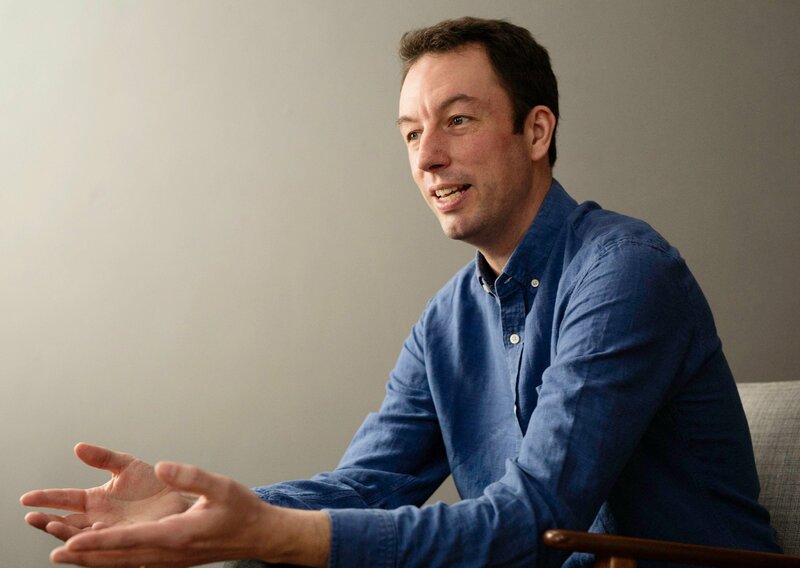 However, even before the Qualification Directive came into force the UK had created a new form of protection it labelled “humanitarian protection”. When the Qualification Directive came into force the label of “humanitarian protection” was used instead of “subsidiary protection.” It will probably prove to be the case that after the Qualification Directive ceases to apply, humanitarian protection will continue. Subsidiary protection is thus a different type of status and form of protection to refugee status. Two of the three elements of the definition of serious harm are covered by the European Convention on Human Rights, however. Whether or not the UK decides to retain the status of “humanitarian protection” as a distinct named category, the UK will not be able to send people back to face the death penalty or torture so long as the UK remains within the ECHR. The fact that Article 15(c) is additional to Articles 15(a) and (b) and the paradoxical nature of the language (“individual threat” … “indiscriminate violence”) have excited some lawyers. The author is not one of them. The key cases on interpretation are C-465/07 Elgafaji and QD (Iraq) v Secretary of State for the Home Department  EWCA Civ 620. Article 15(c) has been held to offer protection above and beyond Article 3 ECHR and in particular to protect from “a more general risk of harm” and to include types of harm that are less severe than those encompassed by Article 3. Arguments based on Article 15(c) have been deployed in the context of returns to Iraq, Afghanistan, Somalia and Libya. It is only really in the case of Somalia and Libya that such arguments have succeeded as stand alone arguments, however, without other arguments based on Article 3 ECHR also succeeding. See ZMM (Article 15(c)) Libya CG  UKUT 263 (IAC) and AMM and others (conflict; humanitarian crisis; returnees; FGM) Somalia CG  UKUT 445 (IAC) (later overturned in MOJ & Ors (Return to Mogadishu) CG  UKUT 442 (IAC)). In AK (Article 15(c)) Afghanistan CG  UKUT 00163 (IAC) the Upper Tribunal held that the levels of violence were not such that all civilians were at high enough risk to qualify for protection under Article 15(c). The tribunal accepted that there might be some people at enhanced risk because of their personal characteristics but declined to speculate on what those characteristics might be. Journalists and physicians were mentioned as possibilities because their professions would tend to expose them to greater risk than others. This was shortly before the rise of Islamic State, of course. The Home Office in 2014 recognised that return to some areas would engage Article 15 and ceased returns to those areas. Whether this cessation in returns was causally linked to Article 15(c) or would instead have occurred anyway for humanitarian reasons or because of Article 3 ECHR or indeed the Refugee Convention is questionable. Contrast this with the position of a person who cannot be removed to another country because to do so would breach Article 3. The legal minimum requirement in UK law is a grant of 6 months of temporary immigration status and no more. External commentators on the position of the UK in the international sphere generally agree that the UK seems isolated, that this is a matter of choice by the UK population and government but that the choice has ramifications beyond the obvious. The recent failure of the UK to secure re-election of a UK judge to the International Court of Justice for the first time in that court’s 71 year history is one possible example. Withdrawing from the EU may give elements within the UK polity a taste for withdrawal from international law regimes generally. Or it may sate that appetite for the time being. Or, if Brexit fails for reasons of utter complexity or damage to UK interests, withdrawal from other international law regimes may become a substitute for Brexit. It should be recalled that the Conservative manifesto for 2005 included withdrawal from the Refugee Convention, that the Conservative Party remains committed in theory to repeal of the Human Rights Act 1998 and that Theresa May stated in 2016, before becoming Prime Minister, that the UK should leave the ECHR. Plans to leave the ECHR have been shelved pending Brexit, but it is not hard to imagine that if the eventual form of Brexit settled on does not satisfy the political hard right then ECHR withdrawal will become a substitute for hard Brexit. if the UK does wish to participate on some level in the Common European Asylum System, for example in reformed Eurodac and Dublin arrangements, then divergence of standards of refugee recognition, protection and rights is unlikely to be helpful to the UK position. In order to square the circle of regaining sovereignty but retaining co-operation, the UK may wish voluntarily to replicate such standards in UK law.